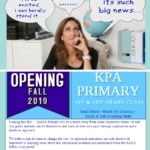 Coming this fall….KnILE Primary will be a home away from home classroom where 1st and 2nd grade students can be themselves and learn at their own pace through exploration and a hands on approach. We believe that it’s time to change the way we approach education, our kids deserve it! Interested in learning more about this educational overhaul and understand what the KnILE Effect is all about?